(Note: This event took place Oct. 11, 2018.) The Lexington-Fayette County Health Department is once again giving you the chance to fight the flu for free. The department’s annual free flu shot event will be held 12-6 p.m. Thursday, Oct. 11, 2018, at the health department’s main location, 650 Newtown Pike. There is no advance registration — just show up Oct. 11 for your shot! The seasonal flu shot is recommended for all people ages 6 months and older. Last year, Lexington had 27 deaths from flu-related causes and 744 confirmed cases. The health department provided 2,275 flu shots throughout the season, including 1,015 at last year’s free flu shot clinic. Be sure to watch (and share!) this Facebook video about how you can be a real superhero by getting the flu shot! 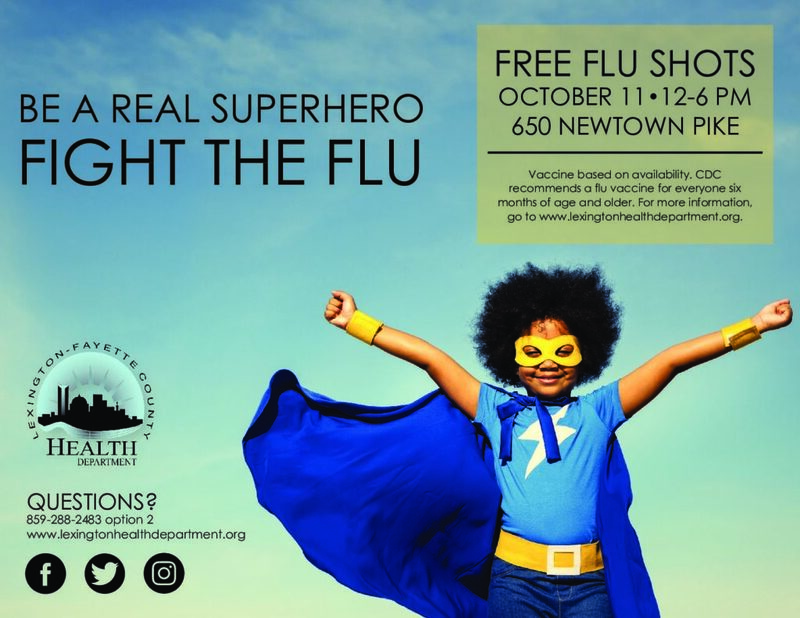 For community members not able to get their flu shots at the special free event, the health department will offer flu shots 9 a.m.-3 p.m. Monday through Thursday in the Public Health Clinic, 650 Newtown Pike, starting Oct. 1. No appointment is necessary, and the cost for a regular flu shot is $30. A high-dose vaccine is available for $49 for ages 65 and older. Medicaid/Medicare, cash, checks, credit cards and most insurance plans are accepted. Previous ArticleNew immunization requirements for 2018-19 school yearNext ArticleDon’t say ‘boo’ to these Halloween safety tips!